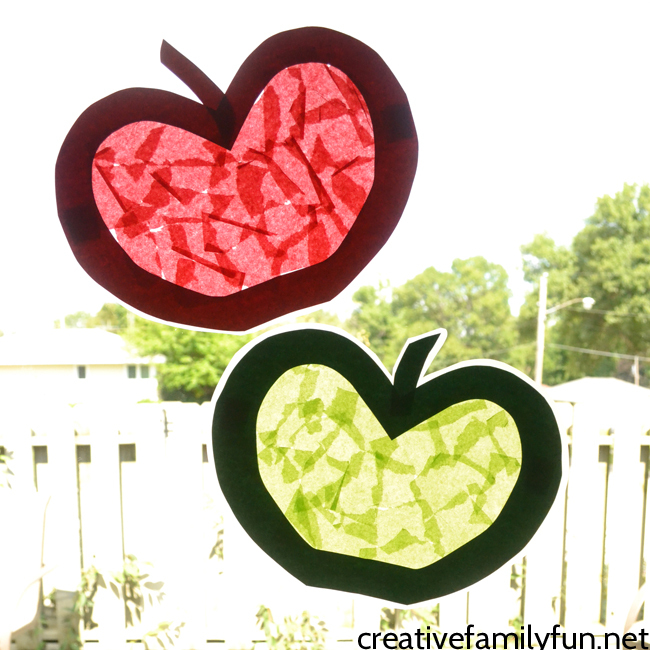 Brighten up your windows with this fun Stained Glass Apple Suncatcher craft. 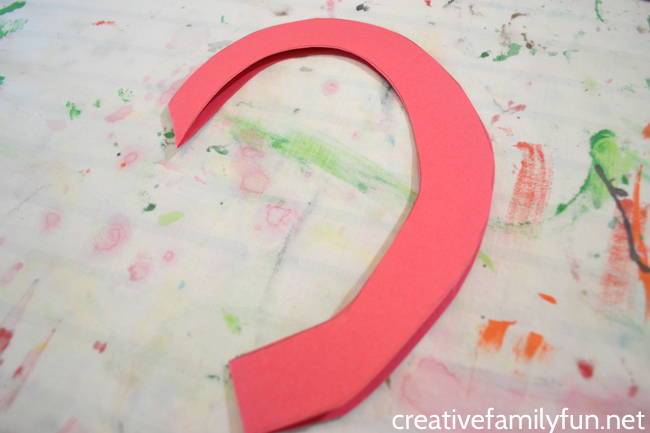 This low-mess craft is great for preschoolers and even toddler (with a bit of adult help). They’ll work their fine motor skills to tear the paper and have fun putting the rest of the craft together. First, we need to prepare the outline of our apple suncatcher. Take your construction paper and fold it in half. Just like you would draw half of a heart, we’re going to draw our apple. The shape is similar to the heart, except make a flat bottom instead of a point. Cut out your apple outline and then cut out the middle. Leave your apple outline connected at the fold. 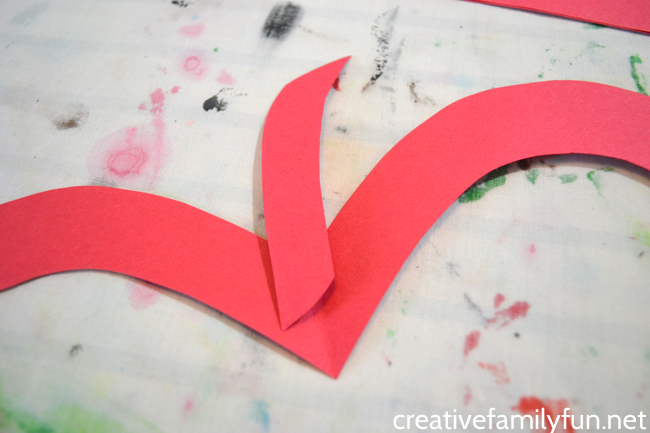 Once you unfold your cut-out, you’ll have a basic apple shape. 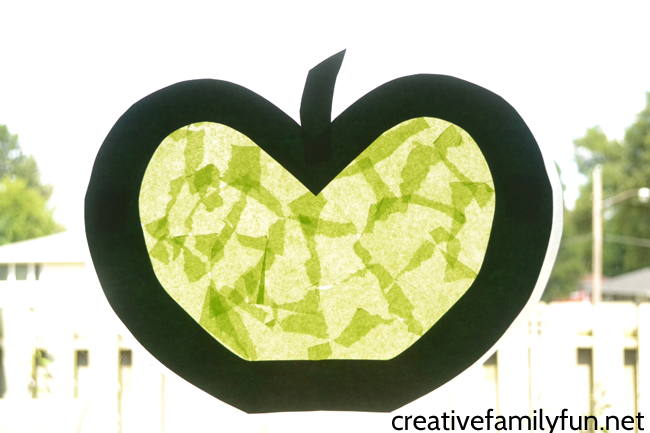 Use your scraps of construction paper to make a simple stem for your apple. Next, tear your tissue paper into small pieces. This is great for fine motor skills! 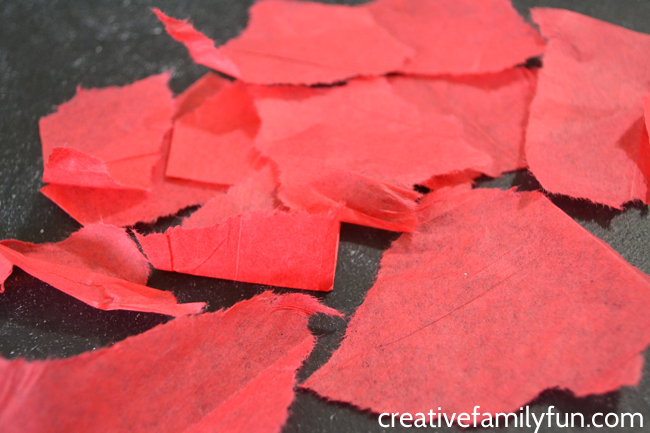 Use red tissue paper with red construction paper and green tissue paper with green construction paper. Prepare your Contact Paper by cutting 2 rectangles that are a little bit bigger than your apple outline and stem. Peel the back off of one piece of contact paper. Turn the paper sticky side up and place your apple outline and stem on your Contact Paper. Depending on the age of your child, this step may best be done by an adult. Hint: If your working with a toddler, you can tape the corners of the contact paper to your table so that it doesn’t slip and slide while your child is creating. Time for the finishing touches! Next comes the fun part! It’s time to stick down the tissue paper. 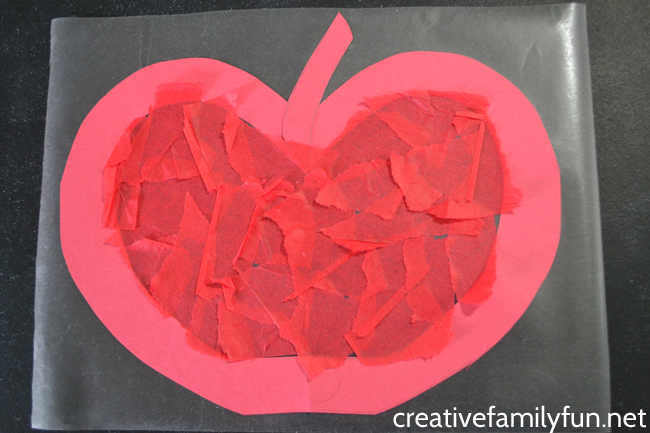 Use the tissue paper scraps to fill in all the entire middle section of your apple. Overlap the pieces for texture. Finally, peel the backing from your second piece of Contact Paper. Carefully apply this piece over the top of your suncatcher sticky side to sticky side. Again, this step is best done by an adult. Trim off the extra edges of your Contact Paper. Leave about a 1/4 inch border around your apple suncatcher so your Contact Paper doesn’t peel apart. Now it’s time to hang it in the window and let the sun shine in! 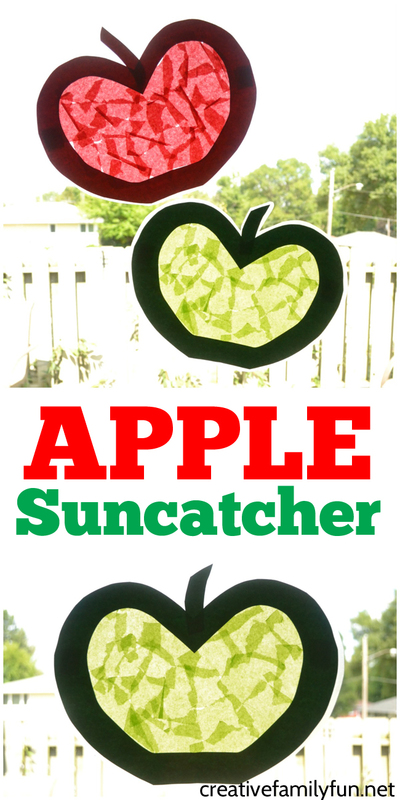 If you enjoyed this Stained Glass Apple Suncatcher craft, the above photo is perfect for sharing on Facebook or you can save the photo below on Pinterest.